BAYFIELD – This past Sunday my hubby and I enjoyed travelling through a time warp when we visited the first-ever Bayfield Volkfest in Clan Gregor Square. As it was the first Volkfest, we weren’t sure what to expect but we were both very pleasantly surprised by the number and variety of vehicles present. We love camping and exploring so our favourite vehicles were the camper vans or buses. A few of them were in a “well matured” state while others had been lovingly restored. Some of the campers featured fun little vignettes complete with funky rainbow tie-dye interiors. 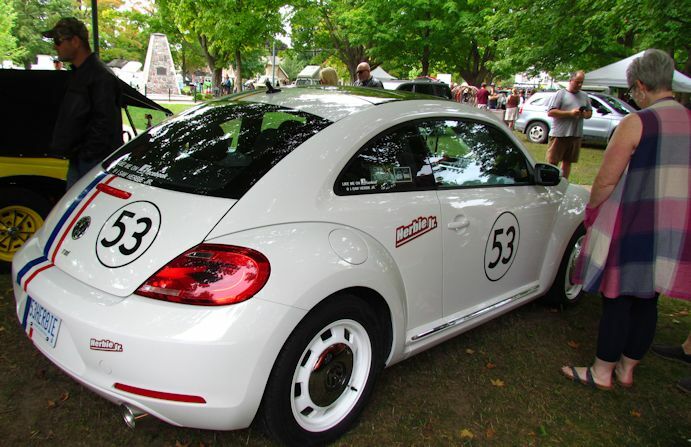 There were also VW Beetles, including Herbie the Lovebug Jr. My favourite “bug” was a red convertible – perfect for summer cruising with the top down. 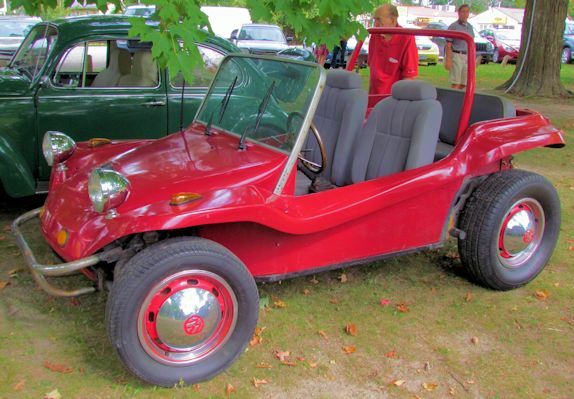 There were a few more exotic species present as well such as the VW Thing, some dunebuggies, and an interloping Porsche. 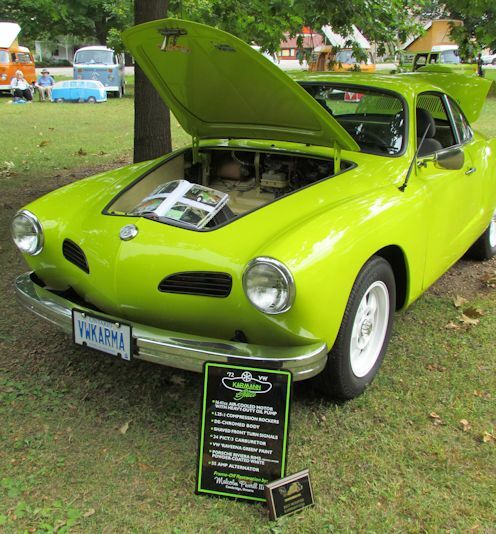 My favourite “exotic” was a lime green 1972 VW Karmann Ghia, which had been lovingly restored from the wheels up. Some of the vehicle owners and a few visitors were dressed as groovy as the vehicles. There was a scent of incense (legal) wafting on the breeze and folk music playing in the background. A few vendors were situated around the park offering health food, locally roasted coffee beans, groovy jewelry, brightly coloured clothes, VW memorabilia, and apparently the grooving hippy’s choice of instrument – the ukulele. A small stage was available for live music performances. While we were there a cute little girl in pigtails was singing her heart out while accompanied by someone drumming on an amplified wooden box and another musician playing the guitar. In the audience, several little children grooved to the beat including one little girl who twirled a rainbow coloured garland in time to the music. Festival organizers Ryan Somers, Jen Reaburn and their eight-week-old daughter, River. 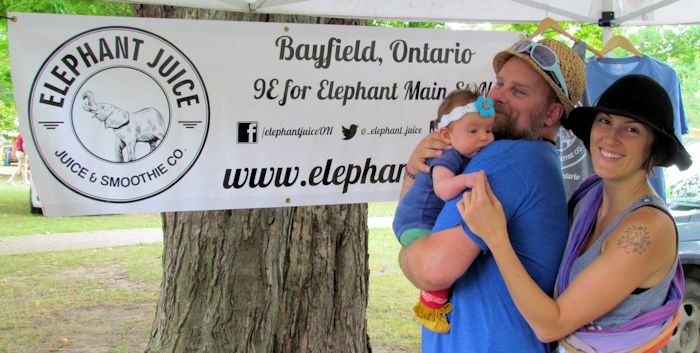 I chatted with festival organizers Ryan Somers and his partner Jen Reaburn, owners of Elephant Juice, Juice and Smoothie Company of Bayfield. Inspired by Bayfield’s Vette Fest and obsessed with VW campers (funnily enough Ryan does not own a VW but he hopes to soon), Ryan thought that it would be a great idea to put together a Volkfest. Incredibly, the festival was literally thrown together in about six weeks! Ryan started it off by creating a Facebook event and emailing a few friends to see if there was any interest. Social media was the driving force behind the success of this festival. Apparently classic VW owners are a friendly bunch who like to get together so news of the event spread quickly. A few area businesses jumped on board. Smackwater Jack’s Taphouse in Grand Bend organized a brunch and group drive. The Ashwood Inn of Bayfield provided the stage and music set-up. Shopbike Coffee Roasters of Bayfield helped to spread the word. This was a free, fun and relaxing event that was suitable for all ages. My hubby and I left dreaming about what adventures we could get up to if we owned a VW camper. Next year’s event is already planned for Sept. 25, 2016. Kora Ferguson, 2, of Amherstberg, explored a VW tent. The family musical trio The Honey Sweethearts of Blyth performed. Sisters Avery, 5, and Maeva Gingerich, 4, from St. Joseph, help serve Coastal Coffee.